The premium assistance tax credit is a federal subsidy available for people and families with income less than four times the federal poverty line. The premium assistance tax credit is meant to reimburse people for the cost of health insurance that's purchased individually through an exchange. The amount of the premium assistance tax credit depends on the income of everyone in a household, the size of the household, and the cost of health insurance in your area. This article walks you through the math involved in calculating the tax credit. The premiums for the second-lowest cost silver plan minus an individual's required contribution for health insurance. A person's required contribution is household income multiplied by an applicable percentage. The premiums for a qualified health plan for the individual, the individual's spouse and any dependents enrolled through a health insurance exchange. Calculate household income as a percentage of the federal poverty line. Find the second lowest cost silver plan on the health insurance exchange. Subtract the required contribution from the second lowest cost silver plan. Then compare that number to the premiums for the health plan in which the person or family actually enrolled. Whichever number is lower is the amount of the premium assistance tax credit for the year. The premium assistance tax credit can be calculated using Form 8962. Below we will walk through the math involved. Household income is the income for everyone in the household. That's a general way of looking at it. the foreign housing exclusion or deduction. Household income is the modified adjusted gross income not just of the person filing the tax return – but also for other people that are part of the taxpayer's family and they are required to file a tax return. By part of the taxpayer's family, we mean that the taxpayer (the person listed at the top of the tax return) is eligible to claim a personal exemption for that person. This would be the taxpayer himself (if he's an independent taxpayer). It would also include the taxpayer's spouse (if they file jointly), and any dependents. And note too, a person's modified adjusted gross income is added to household income only if that person is required to file a tax return. A dependent, for example, who has a little bit of income but not enough to be required to file a tax return would not have to include their modified adjusted gross income in the measure of household income. We add up all the modified adjusted gross income for everyone who is in the family and who is required to file a tax return, and this is the household income. Household income will be converted into a percentage of the federal poverty line (in Part Two, below). This percentage of the federal poverty line is then used to find the applicable percentage, and subsequently to calculate the required contribution. Lower household income results in a higher premium assistance tax credit. The following worksheet shows the math involved in figuring out household income for the year. Divide household income by the federal poverty line. Note that the federal poverty line is based on the size of the family and where the family lives. The result is a ratio of household income to the federal poverty line. Turn this ratio into a percentage. This calculation is related to the applicable percentage (Part Three, below). At different percentages of the poverty line, families will have a different applicable percentage. Use the Department of Health and Human Services (HHS) Poverty Guidelines for the applicable tax year based on whether the person lives in the 48 Contiguous States or the District of Columbia, or in Alaska, or in Hawaii. Then, find the poverty guideline based on the size of the family. This number will be the denominator. Divide household income (the numerator) by the relevant poverty guideline (the denominator). Then multiply by 100 to turn this ratio into a percentage. Round the number to the nearest whole percentage. Why are the previous year's Poverty Guidelines used when calculating this year's Premium Tax Credit Amount? The IRS uses the most recently published poverty guidelines from the Department of Health and Human Services (HHS) based on when open enrollment begins (26 CFR 1.36B-1(h)) when calculating the premium assistance tax credit. For example, in the year 2014, open enrollment began on October 1, 2013, and the most recently published poverty guidelines on that date was the 2013 Poverty Guidelines. So the 2013 guidelines were used when calculating the premium assistance credit for 2014 tax year. There's a 7-step process for calculating a person's applicable percentage. The applicable percentage is based on household income as a percentage of the federal poverty line. This applicable percentage is then used to calculate the required contribution. Starting with household income as a percentage of the poverty line, subtract the percentage in column A of the relevant row in the applicable percentages chart for the year. Subtract the percentage in column B from the percentage in column A of the relevant row in the applicable percentages chart. Divide the amount in step 2 by the amount in step 3. Subtract the percentage in column D from the percentage in column C of the relevant row in the applicable percentages chart. Multiply the amount in step 4 by the amount in step 5. Add the product found in step 6 to the percentage from column C of the relevant row in the applicable percentages chart. The answer is the applicable percentage for that person. * Persons with household income less than 100% of FPL may eligible for Medicaid. Source: Revenue Procedure 2014-37 (pdf), IRS.gov. The applicable percentages are a sliding scale that varies with the level of income. Applicable percentages are lower at a lower household income levels. For 2014, applicable percentages range from a low of 2% for people with household income less than 133% of the federal poverty line (row 1) to a high of 9.5% for people with household income from 300% to less than 400% of the federal poverty line (row 6). Above this income range, we do not measure household income or applicable percentages because persons earning more than four times the poverty line don't qualify for the premium assistance tax credit. The applicable percentage is related to the required contribution. People with a lower applicable percentage qualify for a higher premium assistance tax credit, and vice versa, people with a higher applicable percentage qualify for a lower tax credit. The applicable percentage can change from year to year. The IRS revises the applicable percentages based on increases in the cost of health insurance. The IRS has already released the year 2015 applicable percentages. The rows and columns have been labeled with numbers and letter to make it easier to describe how to do the math. What the final percentage from column B of the relevant row? Bernard has an applicable percentage of 6.65%. We use this to calculate Bernard's required contribution. The required contribution, in turn, will be used to calculate the premium assistance tax credit. Step 1. Determine household income as a percentage of federal poverty line. 210%. Details of step 1: household income is the sum of modified adjusted gross income (MAGI) figures for each person for which Bernard is eligible to claim a personal exemption. Bernard is eligible to claim just one personal exemption (for himself). Therefore, his family size is one. MAGI for the premium assistance credit is adjusted gross income plus the foreign earned income exclusion, tax-exempt interest, and the tax-exempt portion of Social Security benefits. After doing this math, Bernard's MAGI is $24,129. We then divide this amount by the 100% amount of the federal poverty guideline for a family size of one. Bernard lives in New Hampshire, one of the 48 contiguous states, which has a poverty line of 11,490 for a family size of one. So we divide 24,129 by 11,490, which is 2.10. We then turn thus into a percentage, which is 210%. Step 2. Determine the excess of household income as a percentage of federal poverty line over the initial household income percentage in the relevant tier. The initial household income percentage in the relevant tier is 200. 210 – 200 is 10. Details of step 2. Bernard's household income as a percentage of the federal poverty line is 210%. Looking at the chart of Applicable Percentages for 2014, we see that 210% falls within the range from 200% to 250% (on the fourth row). We subtract the beginning percentage (200, column A of the fourth row) from 210 (Bernard's household income as a percentage of the poverty line). The result is 10. Step 3. Determine the difference between the initial household income percentage and the ending household income percentage in the relevant tier. The relevant tier for Bernard ranges from 200% to 250%. 250 – 200 is 50. Step 4. Divide the amount in step 2 by the amount in step 3. 10 ÷ 50 = 0.20. Step 5. Compute the difference between the initial premium % and the final premium % in the relevant tier. The relevant tier has an initial premium percentage of 6.3% and the final premium is 8.05%. 8.05 - 6.3 is 1.75. Step 6. Multiply the amount in step 4 by the amount in step 5. 0.20 × 1.75 = 0.35. Step 7. Add the product found in step 6 to the initial premium percentage in the relevant tier. 0.35 + 6.3% = 6.65%. Basically, health insurance premiums are considered affordable if they are less than a certain percentage of household income. If health insurance costs more than this amount, a person may be eligible for the premium assistance tax credit. Here's a blank worksheet you can use to calculate the applicable percentage. What the ending percentage from column B of the relevant row? Multiply the applicable percentage of household income. That is, the required contribution = household income × applicable percentage. The result is the amount that a particular household is expected to pay for health insurance without any assistance from the government. Example: Bernard has a household income of $24,129, and his applicable percentage is 6.65%. Bernard's required contribution is 24,129 × 0.0665 = $1,604.5785 = $1,605 (rounded up). If Bernard buys health insurance through an exchange and the cost of the health insurance is more than $1,605, he may be eligible for the premium assistance tax credit. This amount corresponds to Lines 8a and 8b of Form 8962. 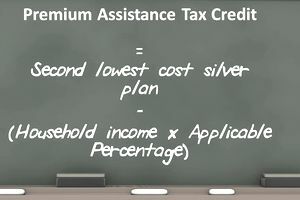 The second lowest cost silver plan is related to the calculation of the premium assistance tax credit. One part of the calculation of the tax credit is to subtract the required percentage from the second lowest cost silver plan. The difference is the tentative premium assistance tax credit. When shopping for health insurance on an exchange, the health insurance policies are sorted into tiers of bronze, silver, gold, and platinum-level plans. Each tier represents approximately how much the insurance will cover medical expenses. Higher-level tiers (such as gold and platinum) provide more coverage of health care expenses compared to lower-tier plans (such as bronze and silver). The second lowest cost silver plan, as the name implies, is the silver plan with the second lowest cost and is available in the area where the family resides that would cover the taxpayer or the taxpayer's family. When shopping for health insurance on an exchange, this is found by sorting the silver plans by price and finding the silver plan with the second lowest cost. When preparing Form 8962, the cost of the second-lowest silver plan is stated on Form 1095-A line 33B. The second lowest cost silver plan (which is abbreviated to SLCSP on Form 8962) acts as a benchmark. The amount of the premium assistance tax credit is based on the relationship between the required contribution and the SLCSP. You don't have to select the SLCSP in order to qualify for the tax credit. You can enroll in any of the plans available through the health insurance exchange. But the amount of the tax credit is based on the cost of the SLCSP. "If a person chooses a policy other than the second lowest cost silver plan, the person pays the difference out of pocket. Even if a person chooses the second lowest cost silver plan, the credit may not cover the entire cost due to other variables in calculating the credit, such as household income. By definition the credit cannot exceed the actual premium owed by the person," notes Mark Luscombe, Principal Federal Tax Analyst for Wolters Kluwer, CCH. The math: the annual premiums for the second-lowest cost silver plan minus the required contribution. The result is the Annual Maximum Premium Assistance (and corresponds to Lines 11D and column D for lines 12 through 23 of Form 8962). This number is a potential candidate for the amount of the premium assistance tax credit. The premium assistance tax credit is the lower of the annual maximum premium assistance or the annual cost of the health insurance plan in which the person actually enrolled. The annual maximum premium assistance is the difference between the second lowest cost silver plan and the required contribution. The required contribution is household income multiplied by an applicable percentage. The applicable percentage is a sliding scale based on household income as a percentage of the federal poverty line. Bernard is a single man with no dependents. He lives in New Hampshire, and his household income is $24,129 in 2014. We've already figured out that Bernard's income is 210% of the federal poverty line in the 48 contiguous states, that his applicable percentage is 6.65%. We had calculated that Bernard's required contribution is $1,605 (that's his household income times his applicable percentage). Going onto Healthcare.gov, and searching for plans in Merrimack county, New Hampshire, we see that the second lowest cost silver plan is $277 per month. On healthcare.gov, this is displayed where it reads "Premium before tax credit $277/mo." Having identified the second lowest cost silver plan, we can now calculate Bernard's annual maximum premium assistance, which is the second lowest cost silver plan minus his required contribution. Bernard is, tentatively, eligible for premium assistance in the amount of $143 per month. Once Bernard finally decides on the actual plan he'll enroll in, we can then compare the cost of the plan to the tentative calculation to see which is lower. Bernard will pay $89 per month out-of-pocket for his chosen health plan (232 – 143, the difference between the full cost of the health plan and the premium assistance tax credit). If Bernard is enrolled in this plan for the whole year, he would pay $1,068 per year for health insurance premiums (89 × 12), which is less than his required contribution of $1,605. Bernard is paying less than his required contribution because he selected a health insurance plan that cost less than the benchmark second lowest cost silver plan. By contrast, if Bernard had selected a health plan that cost more than the SLCSP, Bernard would pay more than his required contribution. Finally, Bernard will need to decide whether to receive the premium assistance tax credit in advance. If so, the IRS will send the $143 premium assistance credit to his insurance company, and Bernard will pay the difference of $89 out of his own pocket. Alternatively, Bernard can choose to take his tax credit at the end of the year when he files his tax return. In this situation, Bernard would pay the full $232 each month for his health insurance. Then, when he files his tax return, he will claim the premium tax credit of $143 for each month he was covered by the plan. This credit will reduce the amount of tax he owes. Or, if he's already getting a refund, the premium tax credit will increase his refund amount. Bernard thus decides between getting the credit now in the form of reduced premium payments each month or getting the credit later. Be aware that the amount of the premium assistance tax credit is based on actual income for the year. The amount of the tax credit that Bernard is eligible for may go up or go down based on changes in Bernard's income, family size, and where he lives. Bernard can provide updated information about his income or family size to the insurance exchange throughout the year. This way the exchange can re-calculate the amount of the premium assistance tax credit for which Bernard is eligible. This can prevent a situation where Bernard receives too little or too much advance payments of the credit. If Bernard receives too little advance payments, the remainder will be refunded to him when he files a tax return. If Bernard receives too much premium assistance in advance, he will need to pay some or all of the excess advance payments back to the IRS. Use your 2013 tax return to calculate your modified adjusted gross income and household income. Revise your household income based on any changes in income you expect for 2014. Use the 2014 poverty guideline chart to calculate your expected household income as a percentage of the federal poverty line. Use the 2014 applicable percentages chart. Use applicable percentage and household income to calculate the required contribution. Use the second lowest cost silver plan for the area in which you live to calculate the premium assistance amounts. Consider using Form 8962 as a worksheet to do your calculations, so you can become familiar with this form. Use your 2014 tax return to calculate your modified adjusted gross income and household income. The second lowest cost silver plan is shown on Form 1095-A line 33B. Use Form 8962 to do your calculations. This form is then included with your tax return for the year. Revise your household income based on any changes in income you expect for 2015. Use the 2015 poverty guideline chart to calculate your expected household income as a percentage of the federal poverty line. Use the 2015 applicable percentages chart. Compare your calculations to the calculation provided by the insurance exchange.